"A recently discovered craniocerebral trauma with major bleeding in the back of the brain along with a skull fracture, indicate a fall or attack shortly before his death." ​​This book compares the scientific and paleo-medical literature side by side with our data.​ People are amazed and PhD's have privately reviewed the data. The book's real time portrait of Otzi was requested for Italy's South Tyrol Museum's 20th Anniversary exhibition in Bolzano, Italy. - Get a trail by trail account of his journey with maps and pictures leading to his final hour. - To get a look at the other Otzi web pages click the Otzi menu tab above. "The Otzi book was very good. Now I'm no historian or expert on archeology but it's good to see RV put to use in such manner and with excellent results. I just hope the archeology and historical community find it of some use. I found the sketches and description of how Otzi died very revealing..."
Learn why Otzi fell from the ridge line (top) into the trench (red marker center). He hit his head hard on stone, rolled over onto his arm, went into a coma and was frozen to death. Look at this difficult off trail positioning. This is not a Neolithic crime scene location or where someone dragged his body! Looking south. As the first scenario to indicate Otzi came to the pass from the North, you will learn where Otzi entered the above map. 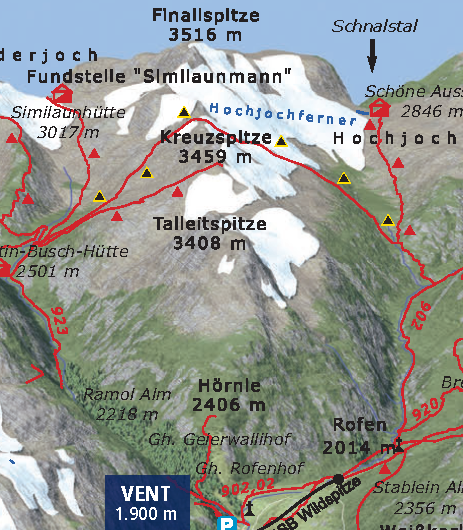 The book uses Alp's trail numbers to show his route from his now known base camp to the end. Otzi's death impact. Otzi flew into the trench from top right corner (#1), hit his head on the rock face up (#2), and went into a coma. He rolled over on to his arm. The downward inertia sent his broken equipment across and up on to the trench's far side (#3 left). The 1 inch arrowhead in his shoulder blade came from his quiver when his unrecovered working bow was sprung, Without putrefaction or the start molecular bone calcification, the arrowhead was obviously not the cause of his immediate death. After falling over 300 feet (92 meters) Otzi slammed into the rocky ledge at about 160 mph (258 kph) top right. His body bounced over to the far side of the trench hitting his head hard on stone face up. He rolled over onto his arm, went into a coma and was frozen. Much of his equipment tumbled all the way through the trench and was on the far bank (left center). This explains all the mysterious equipment damage. "This version of how Otzi died is clearly more plausible than the Museum's Neolithic arrow shot conclusion. This book is loaded with pictures that make the case for why Otzi was at 10,500 feet, where he came from and where he was headed. It will most probably change the nature of the discussion."